Since Google makes news faster than other Internet companies, almost everyone already knows about Google Trends, announced two days ago. In case you’ve been busy doing real work over the past two days: it enables you to type in up to five keyword phrases and shows you the relative number of searches done for those phrases on Google (but there are no numbers, so it is a graph without coordinates.) They also show major news events for those terms and do bar graphs for various countries. It’s possible, I thought, that Google is picking up all searches that included the term (as if they were doing what Google AdWords calls broad match), because KeyWordDiscovery shows many more derivative terms containing cygwin. 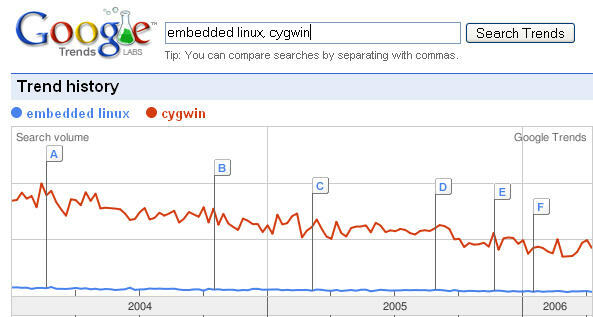 However, that guess was wrong wrt Google Trends: if you want a broad match, you have to separate your terms with a pipe like this: (embedded linux)|cygwin. The real issue seems to be about pitfalls that a service like KeywordDiscovery faces when they sample, and the skew of various kinds of words. KD’s FAQs say that they do use Google as part of their sample, but they also use many other engines. This probably works well for them for most situations except for the one I happend to try. After all, if your company is involved with embedded linux, or you want to understand the market or the competition, you may easily be a manager who could use Google or Yahoo or MSN, typing in embedded linux. On the other hand, my limited experience with real geeks (the kinds who would type in cygwin) is that they use Google almost exclusively.